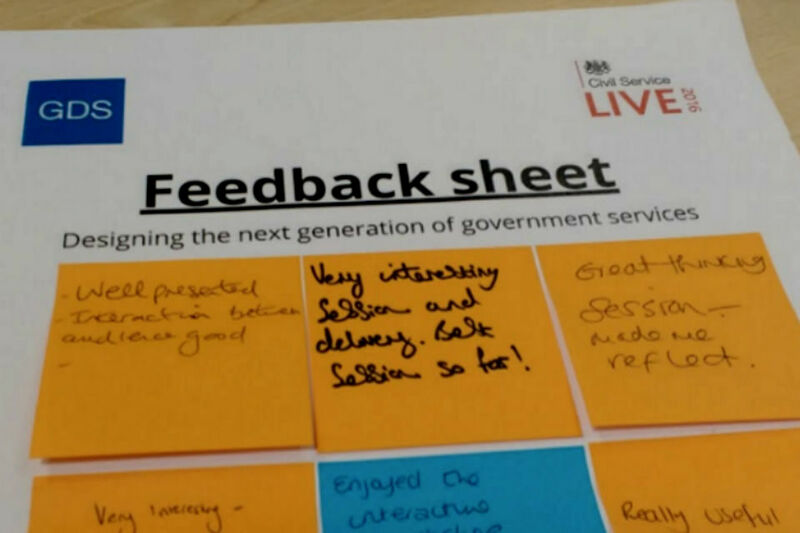 At Civil Service Live (CSL) 2016, a team from the Government Digital Service (GDS) ran a series of workshops to highlight how and why government should focus on creating services that fully meet user needs. Providing great services is part of everyone’s job. Whether you work in strategy, policy, digital or operations, you’re involved in deciding what we provide to citizens and how we provide it. On a daily basis. The sessions, entitled Designing the Next Generation of Government Services, outlined some of the support we provide. And we held an exercise to help those involved in delivering services understand their users. Here are some of the things we shared. At GDS the first of our Design Principles is “start with needs – user needs, not government needs”. We believe government should use this principle in everything it does. Good government services should make sense for the user and meet their expectations, not be imposed on them by departments. Users don’t care about the structure of government. They don’t care which department or agency does what. They just want a service that allows them to do something. When a service doesn't work for users, this can lead to errors, duplications and delays. And this costs government money. Better services for users present better value for money for government. When HMRC redesigned its ‘pay your self-assessment online’ form around user needs, it reduced the costs of support calls. The old form got about 18 calls for each 8,000 payments. The new one is down to 1 call for each 8,000 payments. This sounds simple, but it can be hard for government to put into practice. In our CSL sessions we wanted to hear from colleagues across the country about their experiences working on government services. Then we demonstrated some of the standards, guidance, tools and components that GDS has developed to support departments design services that work for the user from start to finish. The first step to building services that meet user needs is to understand those users. We provided a tangible example of how to do this through user journey mapping. This is a way of showing a user’s 'journey' through a service. It may include many transactions and different services. It starts where a user’s need for that service arises, and ends at the point where they stop using it. User journey mapping helps us maintain a customer-focused approach at all times. At CSL we looked at a common government service: learning to drive. We asked the audience to map out their 'journeys', and then to compare them to those of other audience members’ and spot similarities and differences. At GDS, we’re developing a set of tools that can be used across government by people involved in designing and running services. A number of toolkits will help developers quickly build prototypes quickly or make services in the GOV.UK style. The GDS Service Manual is there to support government departments and encourage them to design and manage their services well. It’s there to help them pass the service assessment – the necessary step to getting an online service into use. It’s continually being updated by experts across government and around the world. One delegate said: “The fact that there are so many small steps and variations of information and action shows how complex a service can be.” Another said the workshop “shows how much process has changed for different people and how it might change in the future”. The point of this exercise was to show that government services don’t always make sense from the point of view of the user. And for services to be successful and efficient, they need to. Another colleague said: "Every user has a different customer journey. It's important to make sure we have enough scope in our services to help every single user." We hope our CSL sessions - and this blog post - gave you an insight into what the next generation of government services might look like if we all start thinking about user-focused service design from the beginning. At GDS we’re doing a lot of work to help you design, build and iterate effective services. This really is just the start. And it all starts with our users. You can find out more about what GDS can do to support your work around services on the GDS blog. Can I suggest we just have systems that work? I know this is a huge ask, but it happens so often that a system errors happens and your PC shuts down in the middle of an interview. I have also lost count of the times new system is launched to great fanfare, then you get the usual follow up email of known issues and workarounds about an hour later. My concern is the focus on building Digital Services, when the focus should be on developing Services that have Digital elements. To be fair this is implicit in the User Journey Map described above, but I perceive that the emphasis is on the Digital element in the false belief that this is only way to improve services and save money. There's an outfit called Vanguard who look at improving end to end services and they claim some very interesting outcomes. It would be nice to know if anyone has had any experience of working with them. The system should be built to recognize and support the user (as to what they might need next or in addition. At the end of one initial visit it should be making suggestions about other services and applications that the user should or could be apply for.